Fresh start motorcycle are Professional motorcycle DSA Approved Motorcycle Training School (ATB) That Teaches in CBT, DAS and Enhanced Rider Skills.7 days a week. Rider Training in all aspects of road riding. being less the 1 mile to the DSA Test center in Atherton As a family run business we small enough to really care about you, and what best suited in your training programme and needs. Yet big enough to cope.We have a Small friendly team of trainers only useing DSA approved trainers we are all also FBos trained. 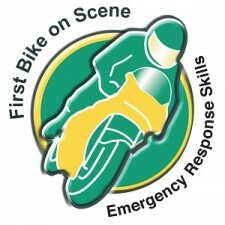 (FIRST AID in FIRST BIKE ON THE SCENE) Togetter we have lots of experience it all types of problems that you may have. A good selection of bikes with lower seat hight if required, our aim is for you to reach your goal. No short cuts or corner cutting here- just high – quality training at a value for money price. 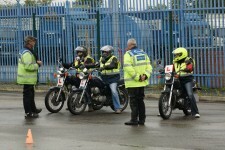 We are based close to the DSA motorcycle test centre in Atherton Manchester; we are the closest training school to this test centre. It’s less the 1 mile away. so from the start you will be learning to ride in the area you most likely be taking your test We have a very large safe off road training areas for CBT and for practice sessions for your mod 1 test ect. 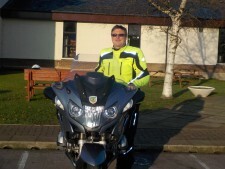 Why did I start my own Motorcycle Trainings School? It was when I was attending a my daughters graduation the advice the lecture gave to the young people now going out into the work place was this “If you can do what you enjoy doing as if when you go on vacation and make this your vocation you will never work another day in your life”This thought really hit home to me. Living and working in North London for 30 years I wondered what did really want to do. Where would I like to be? What did I enjoy doing Etc.? This was the easy part, I enjoyed my Motorcycle riding, and my charity work with Advanced Motorcyclist Group where I had become an observer with them. I enjoyed teaching others become safer better riders and seeing them enjoy their new riding skills. 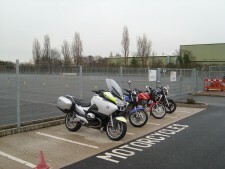 But in 2008 there was changes in the motorcycle test was conducted with the now know 2 part test with new test centres (mptc) required in order to do the new off road manoeuvres, but it meant over a 50 mile trip to the my nearest test centre. Because of this I felt I had to relocate and move my established business closer to one of the new DSA test centres, this we did at the start off 2008.